Hauling coal for Hopis from Black Mesa coal mine article. Mary has for many years been assisting Hopi families obtain coal from the mine just north of the Hopi villages which is located on Hopi and Navajo joint-use lands. This informative article gives you and idea of what is involved. A typical coal run begins well before the break of dawn. 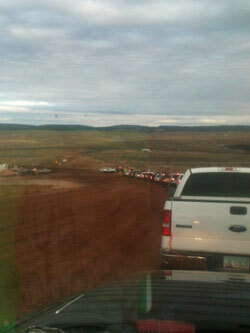 The mines don’t open until 7:00am but trucks begin to line up at the gate much earlier in the morning. The mid-November weather is chilly but not freezing or wet, making an ideal time for a coal run. I am up at 4:00am and out the door by 4:15am headed to Hotevilla. The village is very quiet as I pull up to JoAn’s house. I cut the engine, step outside and wait in the stillness of pre-dawn. The dogs that usually greet me when I drive in are snuggled down in the coal bin to the left side of the house. The coal acts as an insulator and retains heat from the dogs’ bodies and the bin provides a shelter from wind and weather. They show no desire to leave their cozy quarters. I see a beam of light bobbing along a footpath as Theresa and Turbo make their way up to the truck with picks and a milk crate in hand. I am relieved to see Turbo has chosen to come along. He is quite strong and able to lift the larger chunks of coal, which can weigh eighty pounds or more. We load up and head to our first stop, Tuuvi Travel Center in Tuba City. The price of diesel on the reservations, Tuba City included, is typically fifty cents higher than in anywhere else in the state. I don’t usually get fuel for that reason but because of distance to the remote region we are traveling and the time of day, I wisely opt to top off the tank. The Tuuvi restaurant is closed so we picked up some fruit and snacks from the convenience store before continuing on our way. Highway 160 is an interesting route to travel at 5:30am. School buses are collecting children at bus stop along the highway all along the way from Tuba City to Kayenta. I wonder how many hours the children must spend getting to school from these rural regions. It is still pitch black outside at this time of the morning. I’m pretty sure it will be after sunset before the last of the children get home. Such is life for young children in these remote areas. The Peabody conveyor belt and silos appear on the horizon. The sun has risen by the time we turn off the highway and climb up the hill leading through the mining operations. There are huge mounds of coal, a system of conveyor belts, mining equipment, transport trucks and massive earth moving contraptions along the left side of the road leading to the loading area. There is a small airstrip to the right where corporate jets can fly in and out while the executives conduct their business. It is quite evident that Peabody coalmine, albeit remote, is a multi-billion dollar industry. I visit with my passengers, who actually have relatives that live and ranch in a small valley on the right side of the road. The sheep, cattle and horses graze sleepily in the pasture. A windmill spins softly in the wind and provides water for the livestock. The ranch stands in stark contrast to the dazzling array of modern technology and high tech industry on the opposite side of the road. This area is known as Black Mesa and is part of the sacred lands that are shared jointly by the Hopi and Navajo nations. The coal is part of mother earth and is considered to function as her liver, the purifier of toxins and waste. Three miles up the road, we come to the turn off leading to the loading area and join in the line of trucks waiting for the mines to open. On this day the line was short, with only 50 trucks in line. In the past, I have experienced lines with up to 200 trucks waiting in line for hours to load coal. Once the gate is open, the line begins to move quickly. We provided the necessary credentials and coal card and are granted entry into the loading area. The coal is dumped in twenty-foot high piles. There are 4 to 5 rows of coal piles stretching roughly the distance of three football fields. Trucks are backed up between the piles of coal as men and women scurry around loading coal. The overall picture of the loading area reminds me of a really busy ant bed. Turbo finds a promising pile of coal. He hops out and directs me as I back the truck to the edge of the coal pile. We are fortunate that it is a beautiful morning, no wind, no rain, no snow, just a bright, sunny day. We each put on a pair of gloves and start loading the truck. Turbo lifts massive chunks of coal into the truck. Theresa and I pick smaller pieces to load. Coal is mined in seams. Some of it has a lot of shale or rock embedded in it, which does not burn and is undesirable. The best coal is shinny and contains high oil content. There is also a small amount of gold that makes beautiful streaks and patterns in the pieces of coal. I tease the others and say that we only work with “clean coal” like the ads on TV. After twenty minutes or so, the truck bed is full of coal. We return to the checkpoint and retrieve our documentation. We retrace our path and head back to Hotevilla. Once again, we unload, put on gloves and proceed to offload the coal. JoAn’s coal bin is rather small and beat up. It leans at a 45 degree angle with several boards dangling over the doorway. I prop the boards above the opening so that we can pitch the coal into the bin. We make a game of it. Who can make the best shot? I could throw smaller pieces through the opening with no problem but the larger chunks smashed into the precarious doorway and landed just outside. There was no clear winner but we got it done. To date Mary Boles of Hopi Thrival Initiative has raised enough money to buy five small stoves and one large parlor stove for the Snake Clan Kiva. Two more stoves will be delivered in the near future. Did you know that coal burns hotter and longer than wood? Most Hopi use coal to heat their homes. Coal burns at 1100 degrees for up to 12 hours as opposed to wood at 600-700 degrees for up to 6 hours. Stoves that are not rated to burn coal will crack due to extreme temperatures. Hopi and Navajo are issued two coal cards per family per year in exchange for allowing Peabody Coal to mine the coal. As of November 2012, the cost to have coal hauled was $125 per load. According to people on First Mesa, the rate as of January 2013 to hire a truck to haul coal is $150 per load. The cost of a half a cord of wood is $125.